Compost creatures display board promoting childrens activity. Garden Organic's Master Composters are volunteers who encourage people in their local community to start composting at home, and offer support to people who are already home composting and may be having difficulties or need encouragement. Anyone can be a Master Composter – you do not have to already be an expert in composting as Master Composters are trained in 'how to compost' before they start their activities. There are Master Composters of every age group and they come from a wide variety of backgrounds. This contributes to the effectiveness of the scheme – Master Composters can reach parts that other compost promoting activities cannot reach as they talk to their friends, family and neighbours, attend village fairs and it has even been know for a Master Composter to hold a compost-themed children’s birthday party! Volunteer Master Composters are active in local communities nationwide. 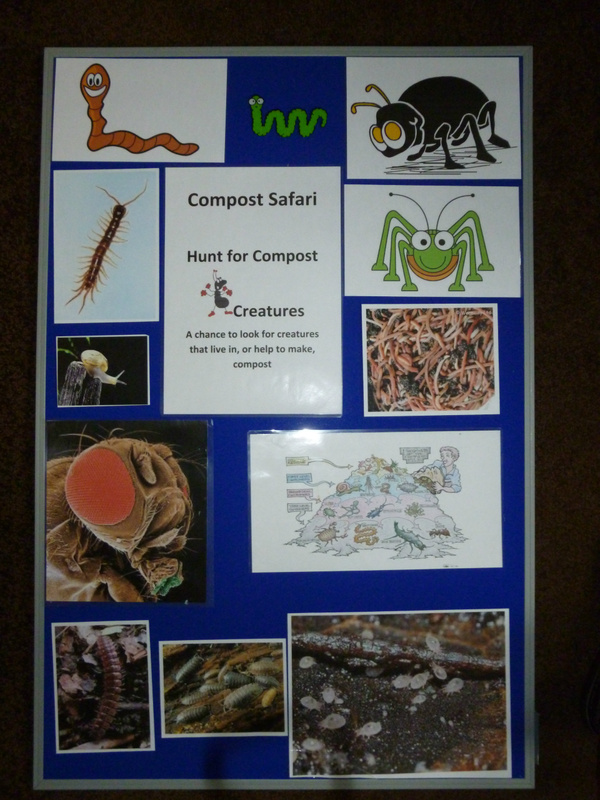 For composting advice, visit www.carryoncomposting.com, created by one of the Leicestershire Master Composter team. Become a Master Composter - The initial training is a two-day foundation course . If you are interested in attending the training course and becoming a Norfolk Master Composter email mastercomposters@norfolk.gov.uk or call Norfolk County Council’s Customer Service Centre on 0344 800 8020. Request the help of a Master Composter - do you need advice, want a composting talk or have an event Master Composters could attend? Please contact us and let us know. Visit the Recycle for Oxfordshire website or read the Oxfordshire Master Composters' blog. Interested in starting a Master Composter Scheme in your area? If you work in waste minimisation/recycling you may want to consider setting up a Master Composter scheme if there is not already one in your area. Whilst some capital input is required, this is offset by the positive influence of the Master Composters on diversion rates of biodegrable waste from landfill. Training: who will provide the Master Composters with the initial training they require on composting and home composting promotion? Resources: what resources will you be able to provide eg uniforms, display resources, technical composting knowledge? Support: the key to a successful Master Composter scheme is on-going, effective volunteer support. Garden Organic consider it is essential that there is a dedicated Master Composter 'Coordinator' to assist the volunteers in their day to day activities. Is there anyone available to take on this role and how much time will they have? Monitoring: to justify the activity it will be important to monitor impacts and outputs. Garden Organic provide a comprehensive Master Composter Programme that encompasses all aspects of a Master Composter scheme, or they can supply certain aspects as required.